Some of the craziest things are going on this month in Texas! There will be potential world-record-breaking dog walks, along with stadiums transformed into dog playing fields! 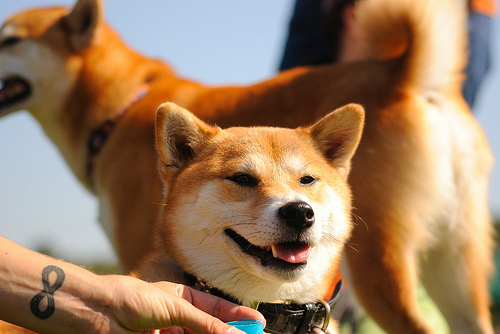 The Dog Bowl will be a crazy event that will go on from 1:00 PM-5:00 PM! Dogs can run around the grounds of this stadium leash-free with human companions. There will be live music, along with an agility course, flyball demonstrations, splash pools, dog contests and caricatures. It is free to attend! This will be the third annual giant dog walk, which has broke the Guinness World Records for the past two years as largest dog walk! 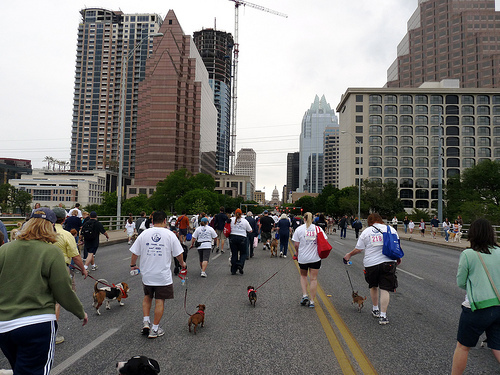 It is a three-mile stroll through downtown Austin that will go on from 9:00 AM-12:00 PM. Upon completion of the walk, dogs will receive gold metals and humans will receive T-shirts. Vendors will also be there to give away dog product freebies. To participate, it costs $25 if you pre-register, and $30 if you register the day of the event. It is meant to benefit the Texas Hearing and Service Dogs organization. Spring Bark will be the sixth annual fundraiser that will go on from 9:00 AM-2:30 PM. It will feature lots of fun events, including agility and frisbee demonstrations, dog good citizen classes, various contests, a silent auction, booths for local rescue groups and $20 pet microchipping. There will also be raffle items. If you wish to attend, it is $25 for pre-registration, and $30 for registration at the event. Part of the proceeds will go to local rescue groups. This Pow Wow will be an Art Show/Pet Adoption Weekend, and dogs and families are encouraged to attend. There will be over 30 independent vendors, a bounce house, hot dogs, costume contests and more. Local rescue groups will be there with pets up for adoption. It will go on from 10:00 AM-5:00 PM both days. This dog walk will be to benefit the Jori Zemel Children’s Bone Cancer Foundation. It will be a 3K walk/run that will begin at 1:00 PM and end at 4:00 PM. Admission is $10; registration entitles a free dog bandana!